Ten CORBA and 17 other volunteers helped to restore 3/4 miles of the Backbone Trail (Yerba Buena segment) this past Saturday February 27. The outside berm of the trail is pulled back to fill in the rut, and to give it a slight slope so water will run off it, rather than down it. This is called ‘outsloping’ the trail. This trail was built about 12 years ago and has had very little, if any maintenance work done on it since. Overall it has held up very well, which shows how well it was designed and constructed, but the lack of rainfall over the past several years has certainly contributed to its longevity. Nevertheless, most of the original drainages were completely filled with silt and had become ineffective, allowing water to run down the middle of the trail, developing and enlarging ruts. As such, most of our work was spent fixing ruts, and repairing drainages or building new ones, to keep ruts from re-forming or enlarging. One long-time volunteer used a gas-powered hedge trimmer to cut back the brush that was starting to impinge on the trail while two people followed along behind to dispose of the cuttings. 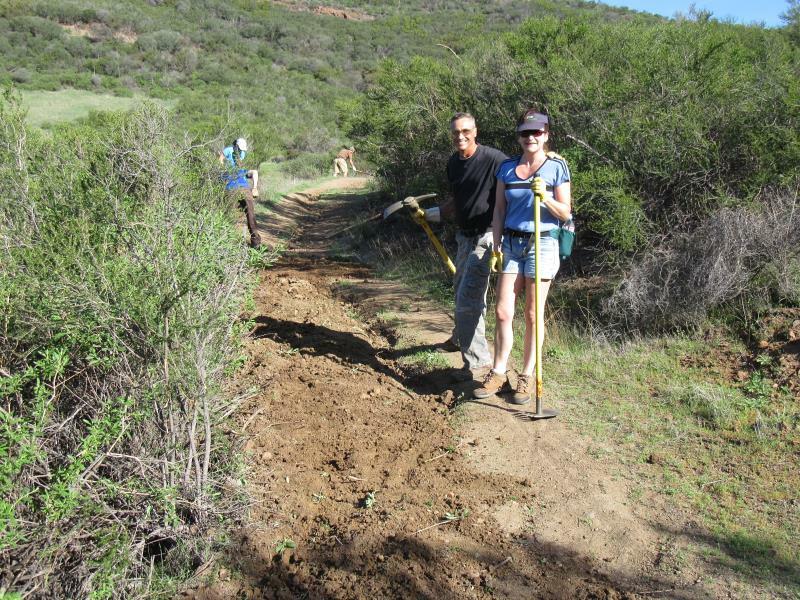 This CORBA crew embarked on a task that was new to us by completely rebuilding a section of the trail about 100′ long. The berm on the outside of the trail that keeps the water on it was chopped up. The dirt was then dragged back over the trail, filling in the center rut and used to re-establish the normal outslope that allows water to flow straight across and off the outside edge of the trail, rather then down the middle to make a rut. This took about three hours. For the rest of the day we joined in the other volunteers in clearing and building drainages. We packed up about 2 pm, a littler earlier than usual, then some CORBA volunteers drove into Thousand Oaks for thank-you lunch on CORBA at the Stonefire Grill. 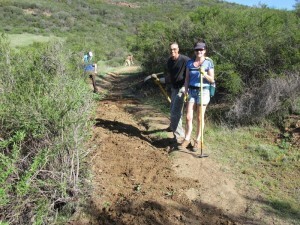 Thanks to all the CORBA and other volunteers who came out to help restore this trail! There are many more photos in our Feb 27th photo gallery for you to view. 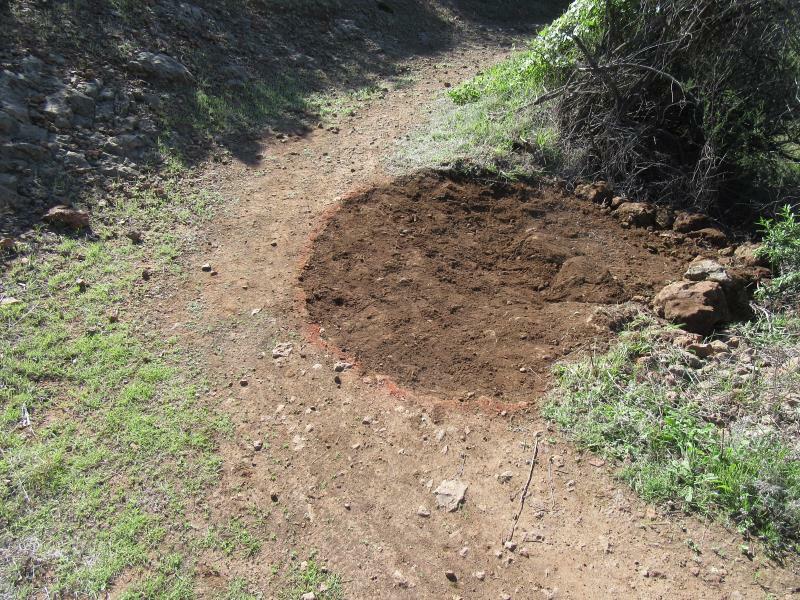 This entry was posted on Monday, February 29th, 2016 at 12:56 pm and is filed under Santa Monica Mountains, Trail Building and Restoration, Trail Crew. You can follow any responses to this entry through the RSS 2.0 feed. You can leave a response, or trackback from your own site.